President Obama supports Mayor Rahm Emanuel, but that doesn't mean he'll be hurt by a Chicago runoff. We're launching a new blog called The Block Club, where we get a little more conversational and sassy. We hope you like it. Sometimes (rarely), the national media realizes that the midwest exists and that there's this big, crazy city in it called Chicago. Coverage is often riddled with unfortunate stereotypes ("Chiraq! Al Capone!") and rarely gets into how complex and fascinating the city actually is. 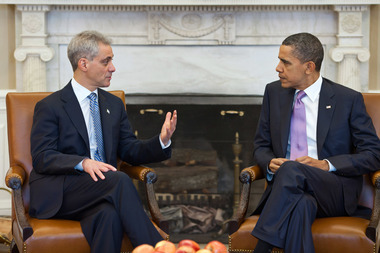 This week, the national media realized there was a mayoral election here, and since they know who Rahm Emanuel is from his White House days, they decided to nationalize it in some way, saying a mayoral runoff is bad news for President Obama and Hillary Clinton. But they're wrong. If Mayor Emanuel fails to get 50 percent of the vote today, it is for purely local reasons. Providing the most competition to the mayor, County Commissioner Jesus Garcia has taken up the populist liberal mantle championed by national figures like Massachusetts Senator Elizabeth Warren and New York Mayor Bill de Blasio. If a runoff occurs, a second round pitting Mr Emanuel against Mr Garcia could boost the hopes of this left-wing faction and cast a national spotlight on the party's ideological split - a development that would be wholly unwelcome in the eyes of those Democrats who are more interested in presenting themselves as united going into next year's general election. "I am voting for Chuy Garcia because he was the next best choice to Karen Lewis and I would have voted for her," said John Vignola, a 57-year-old sound engineer and Wicker Park resident. Vignola's comments Tuesday echo a prevailing sentiment on social media: people are angry about school closings, they feel Rahm has relied too much on high-rollers from other places, they're skeptical of city privatization and nervous about crime in their neighborhoods. Also, when residents have been asked whether they want an elected school board, they've overwhelmingly said yes. Black voters—who came out in force for Emanuel four years ago, in part because of Obama's backing—remain cool. In the Tribune poll, only 42 percent backed him this time around, with a quarter still undecided. That's in large part because minority neighborhoods have borne the brunt of Chicago's recent troubles. Most of the schools that closed are in those neighborhoods. "Bad news" for Obama? The pundits would say yes, but again, we say no. “I still support Obama and voted for him twice, actually three times including when he was senator, and I do not look at Rahm as a soldier for Obama administration and see Rahm as his own man,” said Mikky Wright, owner of Ugly Mug Cafe, 1458 W. Chicago Ave in Ukrainian Village. The assumption that the folks who vote for Chuy or anyone else are super-lefty Democrats that will abandon a Democratic candidate when the presidential election rolls around is a HUGE leap. When Chicagoans go out on a frigid February day to vote for mayor and alderman, they're thinking about what it means for their community. And maybe, just maybe, they want to see some democracy in action after decades having of one supreme leader. Or they want to spend another few weeks hearing what candidates will do to make their neighborhood better.